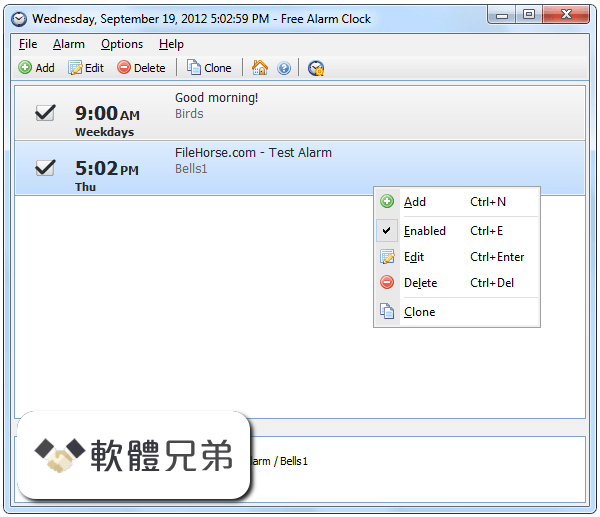 如果您需要用於 Windows 的鬧鐘軟件，這是您正在尋找的軟件。 Free Alarm Clock 支持無限數量的警報，以便您不受限於您可以擁有的警報數量。即使電腦進入睡眠狀態，您設置的警報也會響起。當您的電腦正在睡眠並且需要時間來激活您的鬧鐘時，Free Alarm Clock 將喚醒您的電腦。鬧鐘可以通過播放自己喜歡的音樂並顯示通知消息來提醒您重要的事件。您可以根據一天中的時間將鬧鈴音量設置到一個舒適的級別. - Improved some translations of the user interface. - Fixed: Issue with turning on volume after wakeup in Windows 10. - Fixed: Issue with 12-hour time format when period shows one letter (a/p). Alarm clocks are a standard feature on most cell phones, but computer clocks typically don&#39;t do much but display the time. Free Alarm Clock adds alarm.